Ethnic minorities villages, waterfalls, the Nan river with swimming spots and elevated wooden bridge, the Mani Phruek National Park area, with 9 caves including Tham Pha Phueng (the deepest of Thailand), Doi Pha Phueng (peak and view point), a Hmong sanctuary and a botanical garden. All the excursions, hiking and trekking are not "organized". You can "do it yourself", without agencies. We provide info ad free detailed map for every excursion. 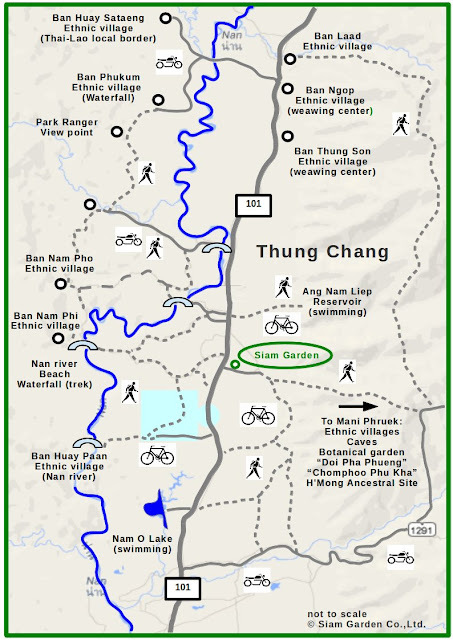 In Thung Chang there are Hmong, Lua, Khamu, Tai Lue and Khunmuang ethnic minorities villages. Among the mountains west of Thung Chang there are the villages of Ban Huai Sataeng (Lua), Ban Phukum (Lua), Ban Nam Sod (Hmong), Ban Nam Sod 2 (Lua and Khamu), Ban Nam Pho (Lua), Ban Nam Phi (Lua) and Ban Huay Paan (Lua). All these villages are also connect to each other by very scenic roads/tracks between the mountains allowing you to visit all the village in a nice off road trip. In Ban Phukum there is a small waterfall reachable with a 10 minutes walk. Between the villages of Ban Phukum and Ban Nam Sod there is a ranger station with a nice view point over Thung Chang valley. In Ban Nam Sod there is the Sod river where it is possible to swim. The villages of Ban Nam Phi and Ban Huay Paan are located near the Nan river, with nice swimming spots. From the village of Ban Nam Phi starts the 4 hours trek to the Tad Mok waterfall. In the mountains east of Thung Chang, there is the Mani Phruek area, part of the Doi Phukha National Park (no entrance fee). There are ethnic minorities villages like Ban Khok (Lua), Ban Nong Pla (Khamu), Pang Khae (Hmong), Pang Khae 2 (Lua), Ban Mani Phruek 1 (Hmong) and Ban Mani Pruek 2 and 3 (Lua). 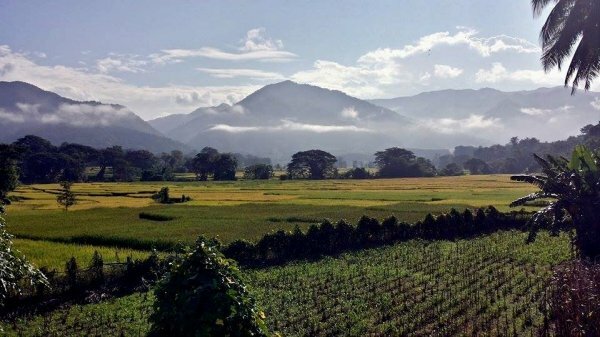 The villages of Pang Khae can be reached with a trek directly from Siam Garden (14 kilometres, 3-4 hours trek). On the way back, you don't need to trek. Just catch a ride from the locals coming down-hill to sell their vegetables at the market. In the Mani Phruek area, close to the Mani Phruek villages, there is a botanical garden (a former government project to help local to switch from growing poppies to more conventional farming), the caves, including Tham Pha Phueng, the deepest cave of Thailand, a Hmong forest ancestral-religious sanctuary, the Chompoo Phukha trees and flowers (a rare specie of plant), coffee plantations and Doi Pha Phueng, a limestone mountains peak with a great view over the mountains and Laos. In the Thung Chang valley, north of Siam Garden, there are more ethnic minorities villages, like the Tai Lue Ban Thung Sun and Ban Ngoop villages. In Thung Chang center, there are some nice temples, like Wat Thuen Phueng, with a Buddha of the 14th century. This temple is located 500 metres from Siam Garden. There is an elevated wooden bridge on the Nan river, located about 3 km from Siam Garden, with a nice swimming spot at the junction with the Nam Lae river. From Siam Garden it is also possible to hike in a hilly country-side surrounded by farmland. Feel free to contact us for more info about Hiking and trekking in Thung Chang, Nan Thailand.